It was another day well spent at a JMP users group event. 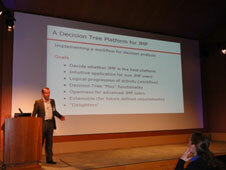 This time rather than taking place at the JMP HQ in Marlow, the event was hosted by Martin Owen at GlaxoSmithKline. Attendance was great (I think I counted over 60 people), and we had a real mix of different backgrounds – in the industries we work in, our technical backgrounds and our JMP expertise. The talks provided some interesting examples of how people are using the software, and it never ceases to amaze me the range of applications the software has, from graphical interpretation of Vodafone’s data through complex scripts for decision making at GSK, to statistical analysis using partial least squares. In addition to the industry talks, Ian Cox from JMP gave a whirlwind tour of the some of the new features in JMP Pro, Version 10. Although I have been using the new version as an early adopter for several months, I had not noticed or not fully explored many of the features. As always, the day with packed with “aha” moments as I uncovered yet more new features, new ways of looking at data and new ways for JMP to enhance my work. ...Oh and did I mention the new JMP iPad app? Well, if being able to open your data directly in Graph Builder isn’t a good enough reason for rushing out and buying an iPad, then I’m not sure what is!! My only concern is how I can improve on the day as I will be host for the next users event in Newcastle (26th September – put it in your diary now) – well, I guess having John Sall as a speaker may help. If you also attended the UK users group meeting last week, let me know what you thought of it – add a comment below. And do join us in September!